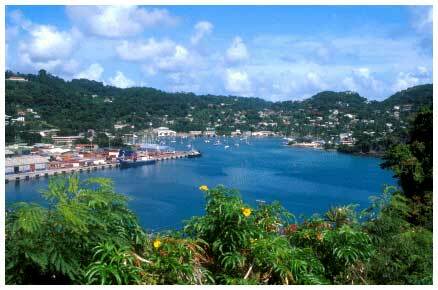 Grenada is made up of 6 parishes, St George being the Capital, St David, St Andrew, St Patrick, St. Mark and St. John. The country offers many nature trails, national parks, lakes and mountains that you can explore. Spice Plantations and sugar plantations can also be visited along with the Rum distillery that still uses an old traditional water mill. Restaurants, bars, shops and marine facilities are plentiful so Grenada can cater for every need and taste. St George is the capital of Grenada. The airport Point Saline International is located here. St. George has a horseshoe-shaped harbour, surrounded by a paved walkway, Whaft Road, the walkway is dotted with cannons form the island’s forts and are now used to tie up boats. As you walk around you will see colourful warehouses, red-tiled roofs and traditional shops and family homes. It is said to be the most picturesque city in the Caribbean. Fort George (Originally Fort Royale) is situated on a volcanic spine elevated 175 feet above the harbour of St George. The fort was built by the French between 1705 – 1710. The original eighteenth century structure is one of the finest remaining examples of a Vauban-style masonry fortress in the world. 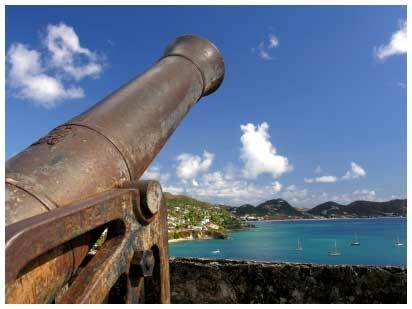 This spectacular fort with its stunning views now houses the police headquarters for Grenada. The fort still maintains a battery of cannons and they are still fires on special occasions. 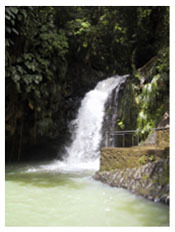 Annadale Waterfalls is on the outskirts of St George and is one of the easiest falls to get to. The path leading up to the falls is lined with local fruit trees and flowering plant. There is another fall on the way up to Annadale but it does not have a name, during the rainy season this fall is larger than Annadale Waterfalls. Saint David is the only parish of Grenada that does not have a main town. It’s located in the south east and is the fourth largest parish. Saint David’s beauty lies in its complete rural state, a rocky coastline that gently slopes up towards the central mountainous range and fringed with bays and inlets and a variety of secluded beaches. Saint Andrew is the largest parish in Grenada. The main town is Grenville which is also Grenada's second main town after St George's. The parish dominates the eastern coast and has the longest coastline of Grenada. Grand Etang Lake is situated among the volcanic mountains of Grenada's Central Range, Grand Etang Forest Reserve. The lake is over 1700 feet above sea level and fills the ancient crater basin of one of the island's extinct volcanoes. With lush rainforest around the lake the views are not only spectacular but are filled with rich diversity of flora and fauna. Colourful tropical birds fly overhead while the tiny frogs and lizards can be found among the grasses. Opossums, Armadillos, Mongooses and Mona monkies can be seen while you walk through the forest. This is a sight not to be missed. Seven Sisters Trail and Waterfalls is located in the Parish of St Andrew; the hike can take between 45 minutes to 4 hours depending on how high you climb. To begin with you will pass through the cocoa, nutmeg and banana plantations, then into the rainforest with its emerald vegetation. The name comes from the fact that it passes by seven of the Grand Etand’s beautiful mountain waterfalls. Once you get to the falls you can take a dip in the pools at the foot of the falls that are quite large and swimming will be very refreshing in the cool water. If you prefer you can sit and relax taking in the ambiance of the real tropics at its best where Flora and fauna grow abundantly. Honeymoon Falls is a little harder to get to but a hidden gem set in the rainforest. This waterfall is a breathtaking delight that is well worth the extra hike. St Patrick is an agricultural parish located in the North of Grenada. It has several large estates that account for a significant share of cocoa and nutmeg production. Saint Mark’s main town is the fishing port of Victoria. It is the smallest parish of Grenada but is the most prominent with Mount Saint Catherine towering 2756ft above sea level and is the highest mountain of the Caribbean. You can hike to the top but you will need to take a guide and be of a high fitness level as the hike is challenging. Saint John’s Parish located on the West coast of Grenada it is known as the place that never sleeps, its main industry is fishing and the capital is Gouyave. Concord Waterfalls is a trio of picturesque cascading waterfalls. 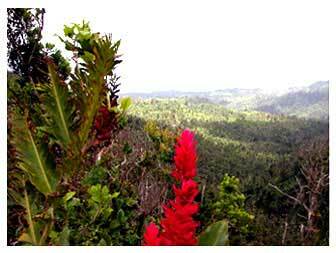 They are located in Grand Etang Nature Reserve on the western side and have walks to suit all levels. The first fall, Concord Fall is accessible by road and the water is crystal clear and very cool, you can sit in the pool and have the water flow over you, a very revitalizing and exhilarating experience. The second fall, Au Coin is the largest of the falls, it is approximately 45 minutes hike. The sweet smell of nutmeg is in the air as you hike through the plantation and along mountain ridges covered in dwarf trees and mountain palms. The third fall, Fontainbleu, is a spectacular fall cascading 65 feet into a crystal pool. Harvey Vale is a picturesque little village of Tyrrel Bay. There is not much there but it is a great place to sit in a restaurant or bar and look out at your yacht in the bay. You can also pick up a few extra provisions from the few small local shops. Hillsborough is the bustling heart of Carriacou, it is the main town where you will find supermarkets, gift shops, local government and the police station. In the day you will find it bustling with people, very noisy and full of life, but when the sun goes down this lively town turns very quiet with little activity. Restaurants and bars welcome charterers and yachtsmen and the locals are always friendly and happy to help. Windward is a significant fishing village on the east coast. In the harbor you will see all the local fishing boats that rely solely on wind and experienced skippers to maneuver and navigate the boats around the reefs. 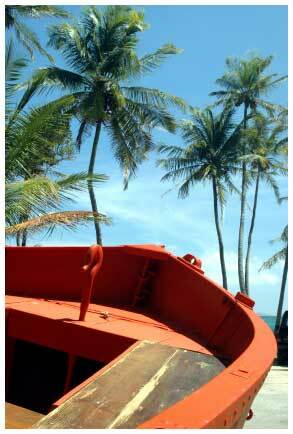 You can see the traditional wooden fishing boats being built here on the beach. * PLEASE NOTE - SOME OF THE CRUISING GROUNDS OF THE GRENADINES ARE FEATURED ON OUR ST. VINCENT WEBPAGES. DEPENDING UPON THE DURATION OF YOUR TRIP YOU MAY WANT TO VISIT SOME OF THESE OTHER ISLANDS OR EVEN ST VINCENT ITSELF. PLEASE FOLLOW THIS LINK FOR ST VINCENT AND THE GRENADINES INFORMATION.